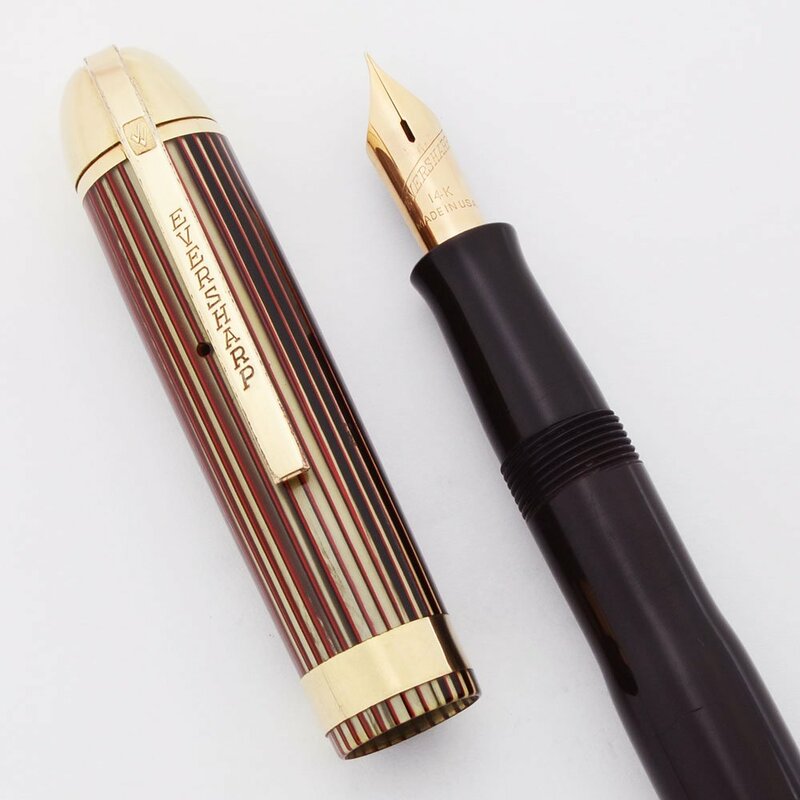 Eversharp Skyline fountain pen with brown barrel and section. The cap is green/black striated celluloid. 3/16" gold cap band with a gold filled derby. Firm extra fine 14k nib. Excellent condition, restored and working well. Product Name Skyline. This was one of the upscale versions sold in jewelry stores, with a wide cap band and gold filled derby. Length The fountain pen measures 5-5/16" . Color Dark brown derby, barrel, and section. The cap is green/black striated celluloid. It also has a 3/16" cap band and gold filled derby, both of which are uncommon. The trim is gold filled. Nib EXTRA FINE 14k nib. It's got nice tipping and feels smooth. It is a bit springy, but no line variation. Condition Excellent condition. No cracks, dents, or personalization. The pen is shiny and pretty, with the cap detail offering an attrractive highlight. The lip of the section has a chip. The section also has some light tool marks. Both cap and barrel have light to moderate scratching. The lever has some plating wear. Imprints are clear.